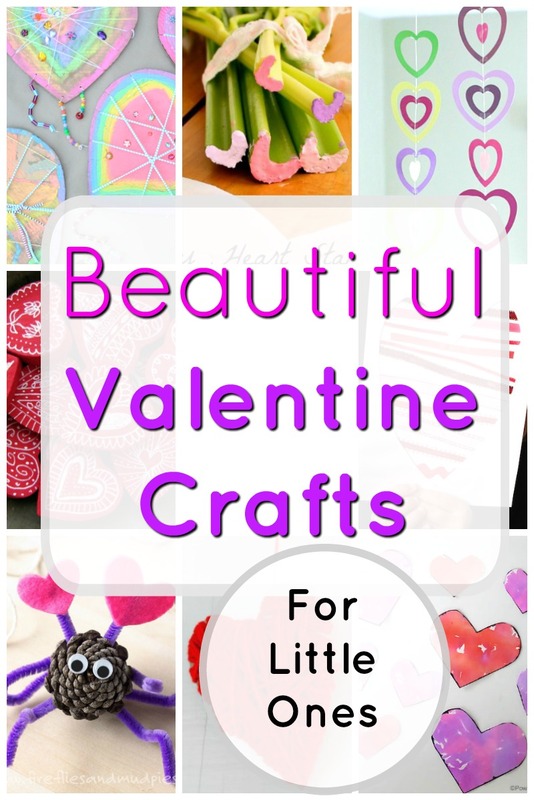 It is only 1 week away so I thought it time to think about Valentine’s Day crafts! Are you getting into the holiday spirit yet?! I know what your thinking – ‘holiday spirit’ – good grief! We are talking Valentine’s Day, right? Because you see, for those of us who do not enjoy the winter, these holidays are all we have to look forward to. Well, that sounded rather bleak – of course there is my incredible family, friends, and beautiful babes. But also snow. And cold. 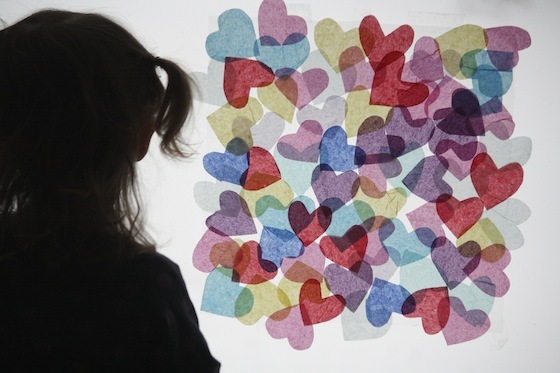 And so – Valentine’s Day preparations it is. 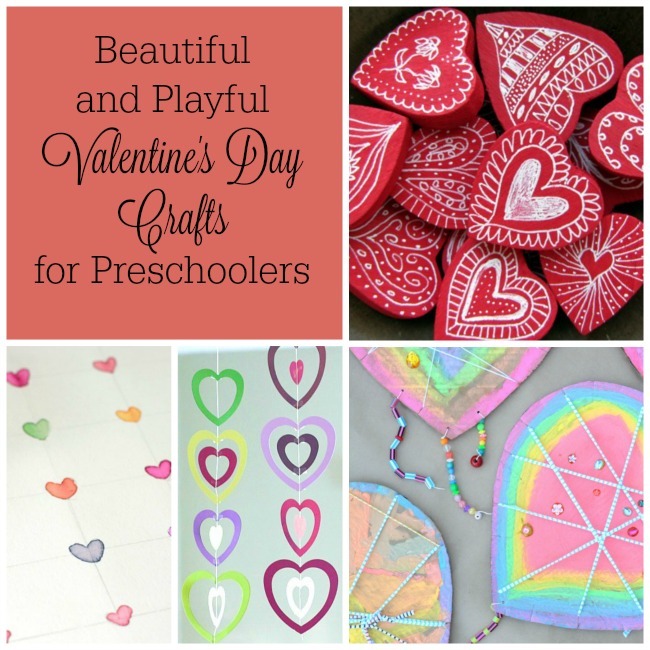 These Valentine’s Day crafts for preschoolers are beautiful and playful. Perfect for in the classroom or at home. I hope you like them! 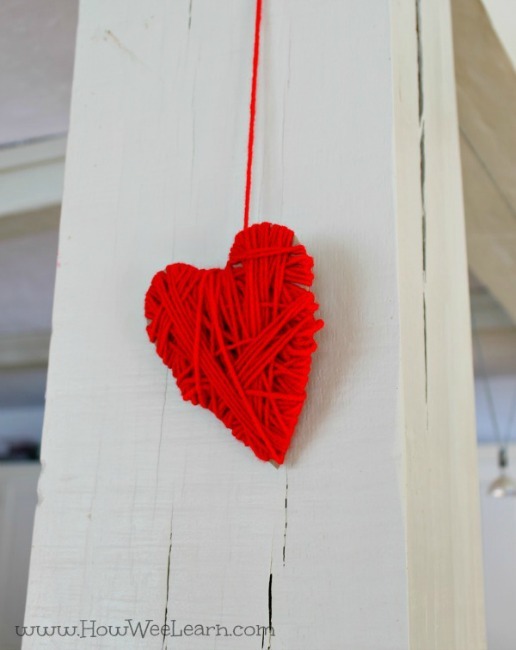 Yarn-Wrapped Hearts – Cardboard and yarn are all you need for this simple and fun Valentine’s Day craft! 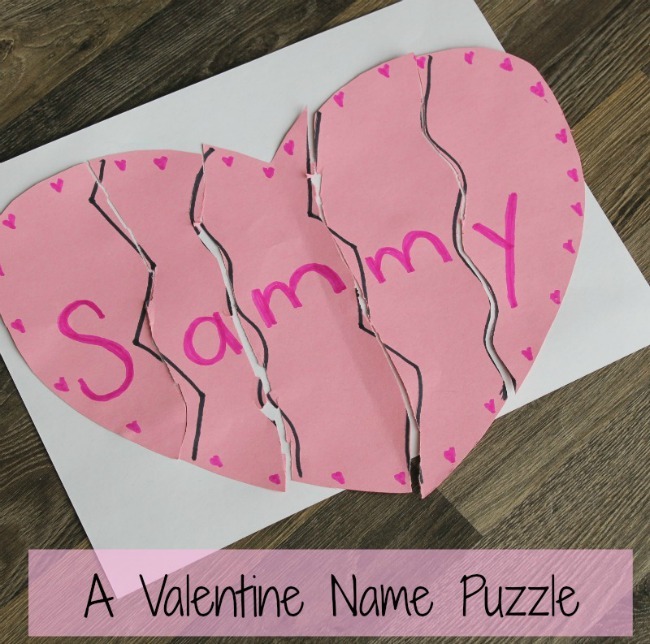 Valentine Name Puzzle – Name puzzles are a hit around here, so we decided to try one with a Valentine twist. 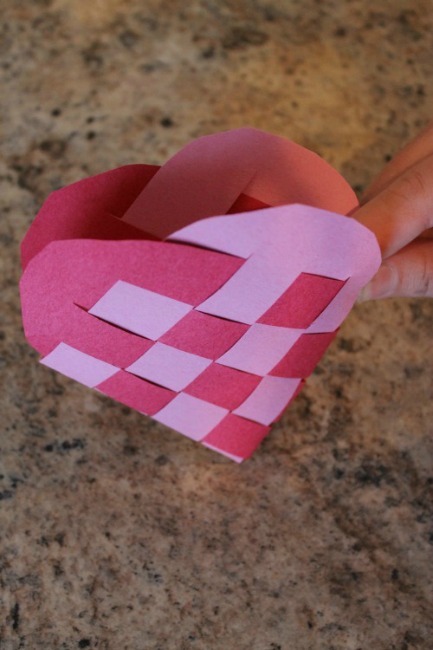 Woven Heart Basket – This is a fun way to introduce children to weaving and patterns! 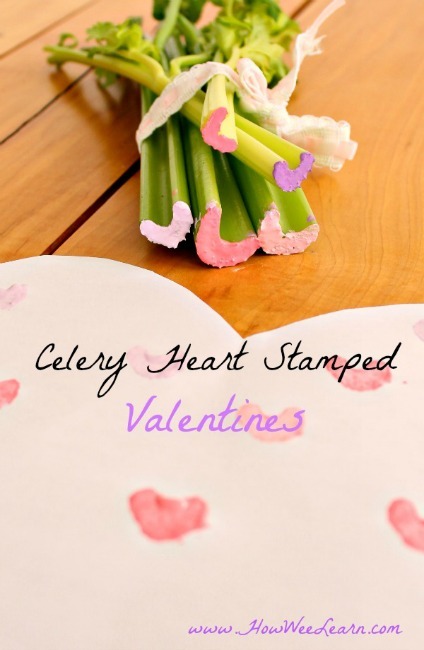 Celery Heart Stamped Valentine – This Valentine’s Day craft is perfect for a wide range of ages. 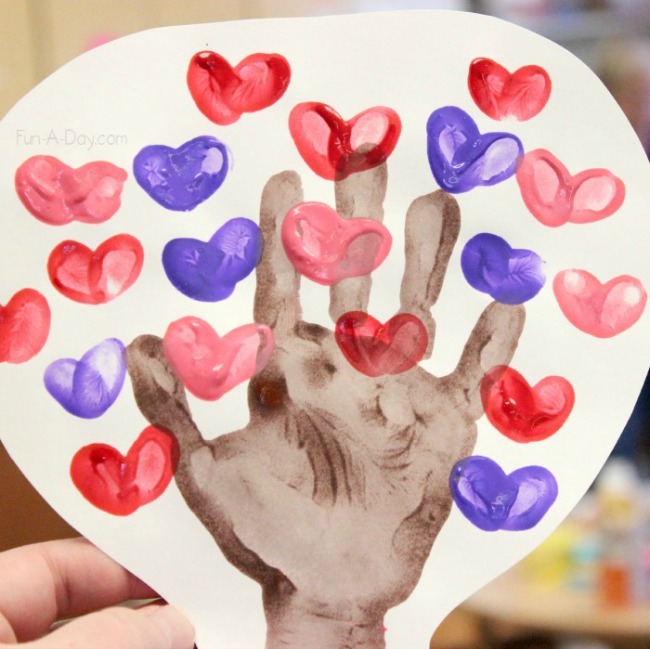 Valentine Hand Print Heart Tree from Fun-A-Day – Let the kids use their hands and fingers to make this festive tree. 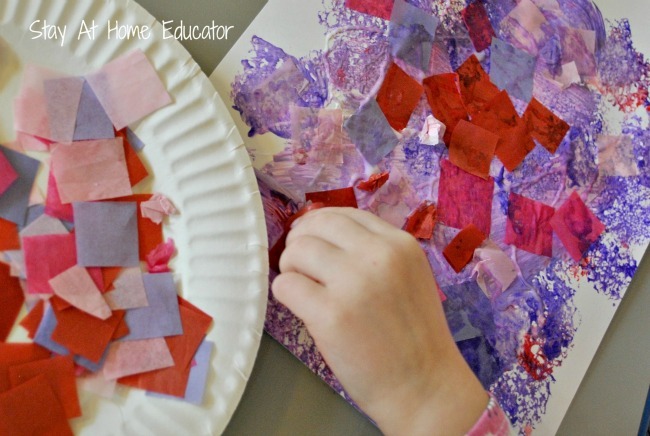 Valentine Collages from Stay at Home Educator – Let the kids’ creativity run free with valentine-themed art materials. 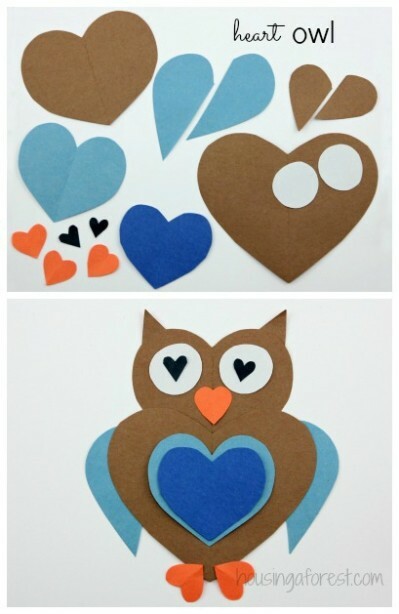 Heart Animals from Housing a Forest – Hearts can be used to make so many different animals! 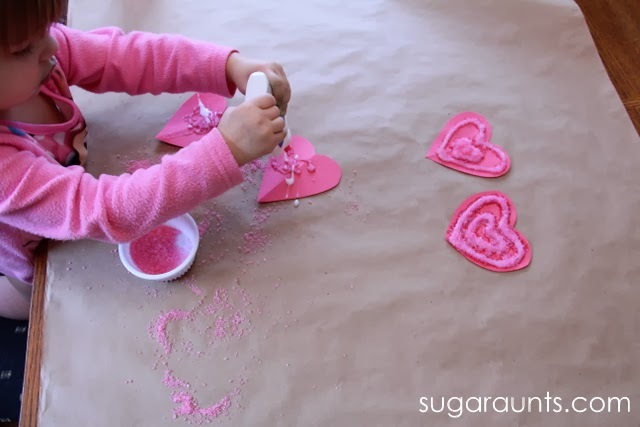 Valentine’s Day Fine Motor Sparkle Craft from Sugar Aunts – Kids explore their five senses with this hands-on Valentine’s Day activity. 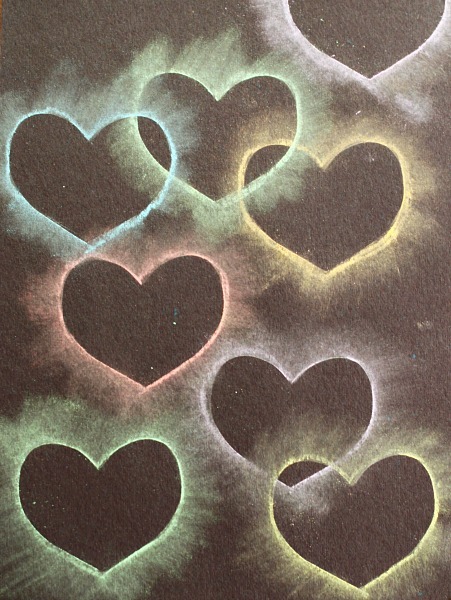 Chalk Stencil Heart Collage from Buggy and Buddy – Grab a few simple craft supplies and let the little ones make collages for their valentines. 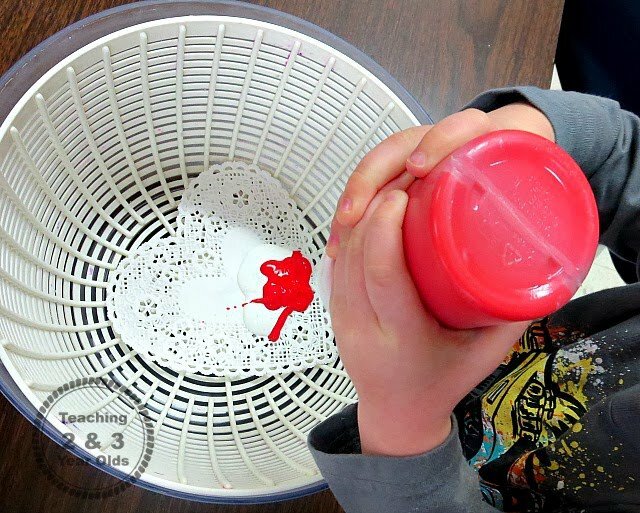 Spin Art Valentines from Teaching 2 and 3 Year Olds – Little ones can make these spin art creations using a simple kitchen tool! 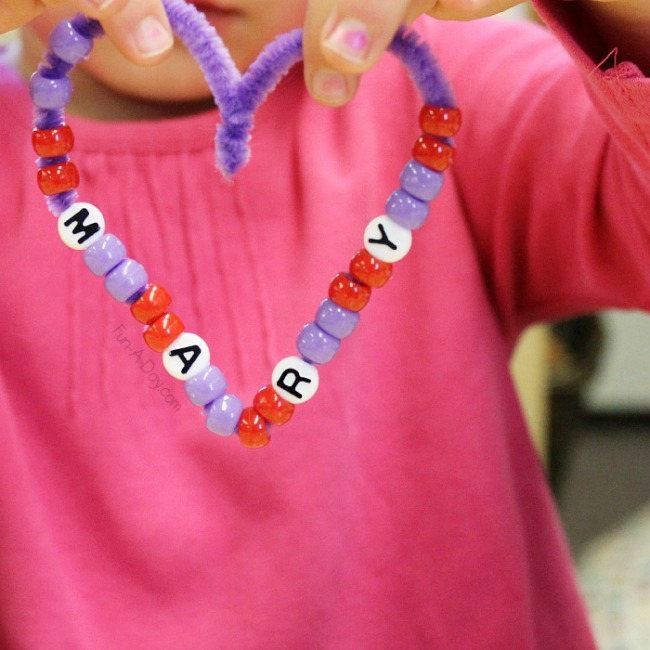 Beaded Name Hearts from Fun-A-Day – Perfect for little ones who love beading! 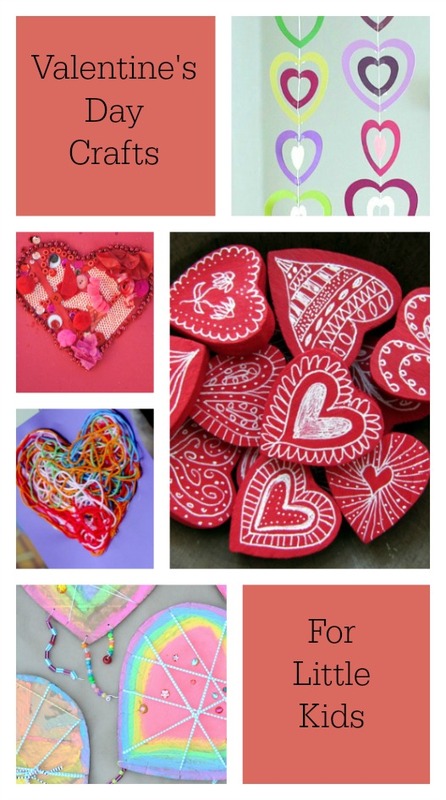 Sparkly Hearts Collage from Kids Play Box – These beautiful hearts are so easy to make, but I can see the kids spending hours creating them. 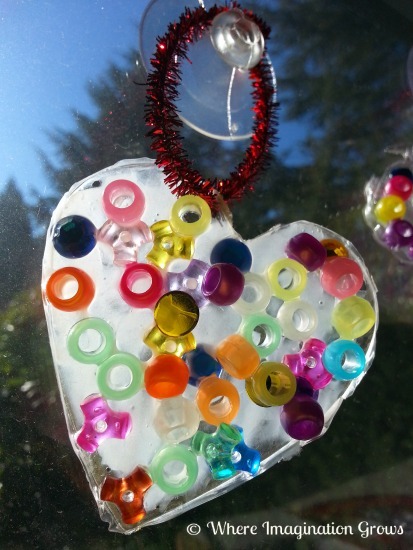 Heart Suncatchers from Where Imagination Grows – Children are sure to love the process behind these Valentine’s Day window decorations. 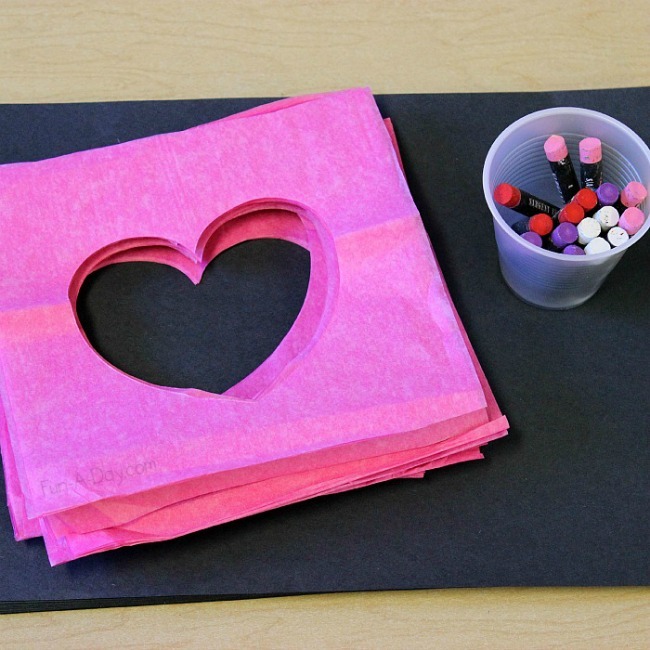 Tissue Paper and Pastels Valentine Craft from Fun-A-Day – This simple invitation gives children lots of opportunity to create! 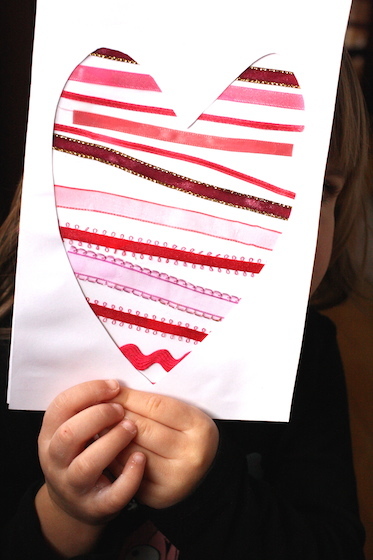 Ribbon Heart Valentines Cards from Happy Hooligans – Kids love getting into the ribbon stash, and this card is the perfect reason to do so! 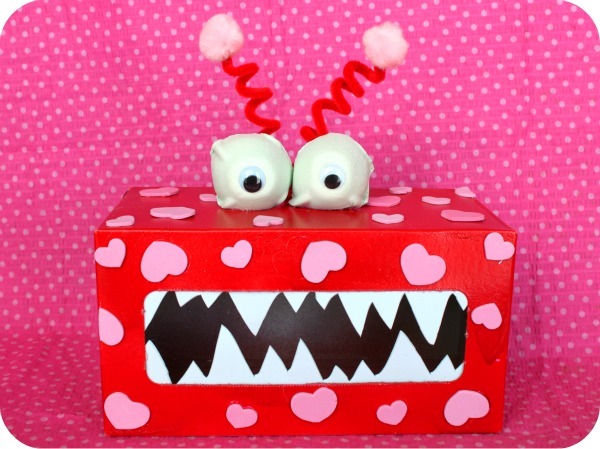 Valentine’s Monster from Giggles Galore – Kids can make monsters to gobble up valentines at their class parties! 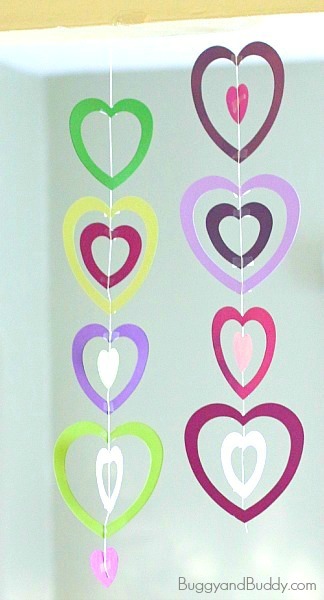 Paper Heart Mobile from Buggy and Buddy – This paper craft would look great hanging in the window this February! 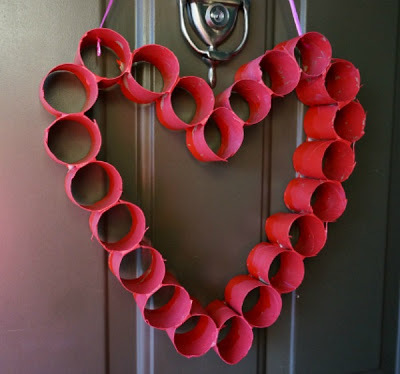 Cardboard Roll Valentine Heart from Kitchen Counter Chronicles – This would make a fun group project with siblings or classmates! 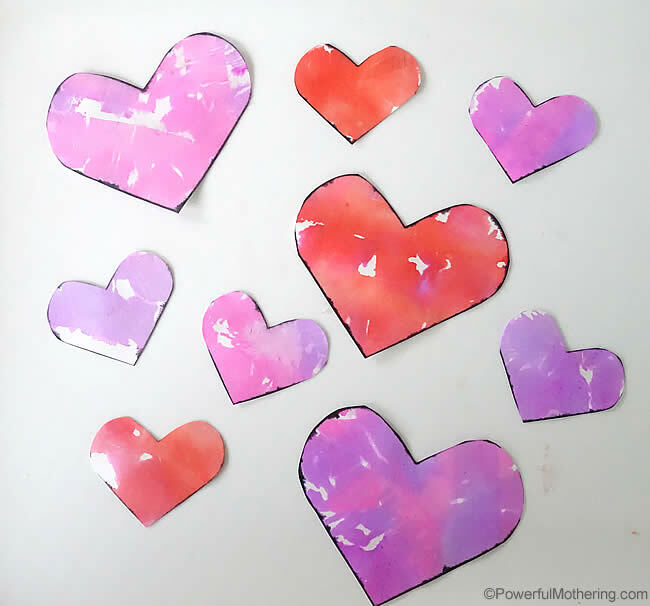 Tissue Bleed Valentine Hearts from Powerful Mothering – Bleeding tissue paper, card stock, and water are all the kids need for this Valentine’s Day art! 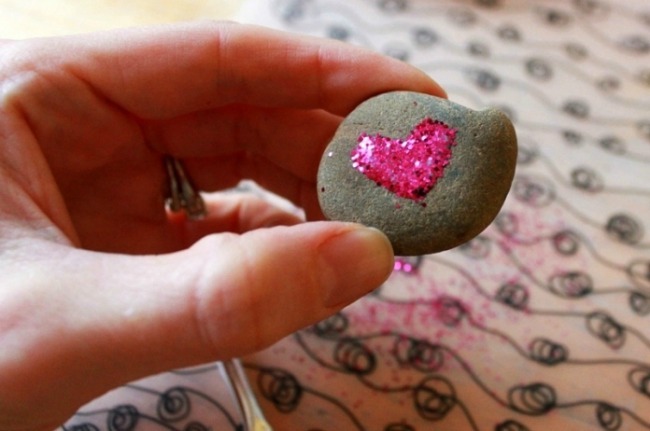 Glitter Rock Valentines for Kids from The Artful Parent – Add a little bling to pet rocks in honor of Valentine’s Day! 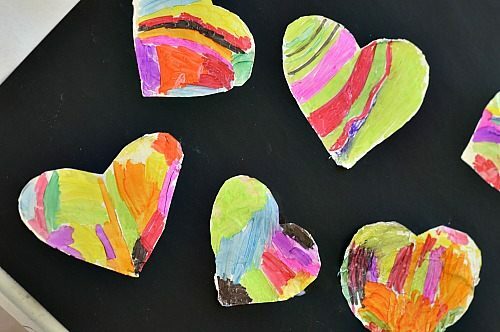 Kid Made Heart Votives from Mess for Less – A fun and frugal gift the kids can make for friends and family. 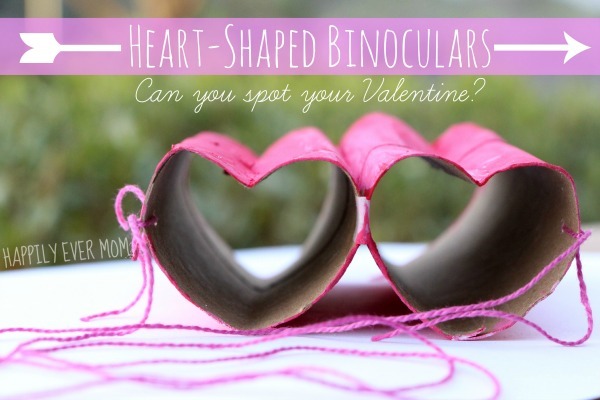 Heart-Shaped Binoculars from Happily Ever Mom – These binoculars would be perfect for a winter nature walk around Valentine’s Day! 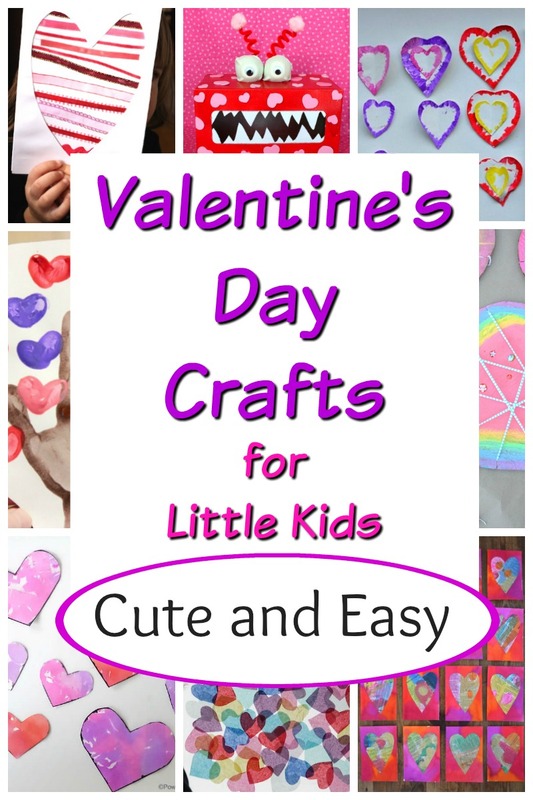 Bead and Pasta Hearts from Kids Craft Room – Two ways to make heart-shaped gifts or decorations with the kids. 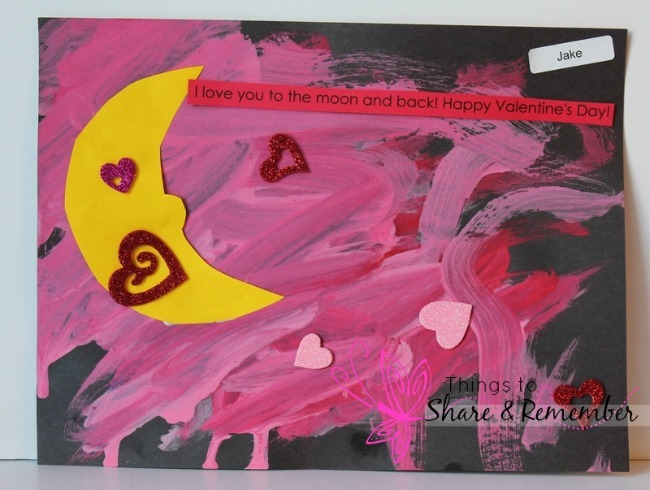 Love You to the Moon Preschool Valentine Art from Things to Share and Remember – Beautiful multimedia art for kids, based on a sweet saying they often hear! 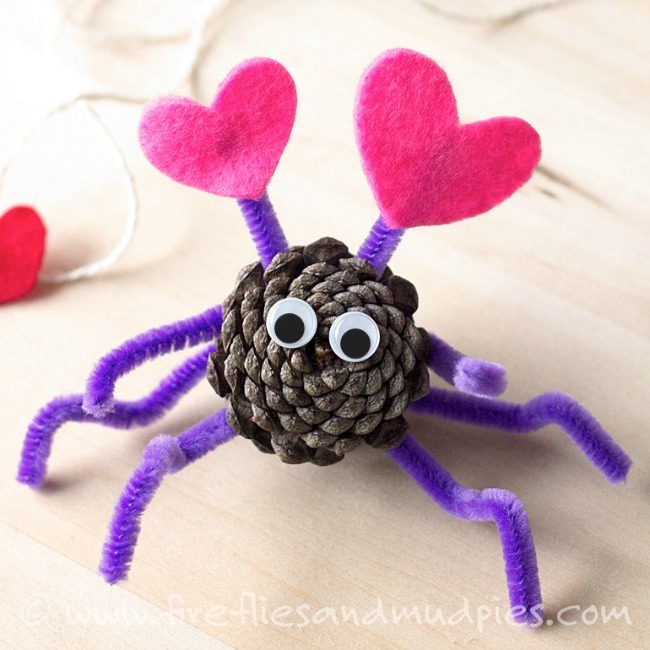 Pine Cone Love Bugs from Fireflies and Mud Pies – Go for a walk outside, collect some pine cones, and then make some love bugs with the children. 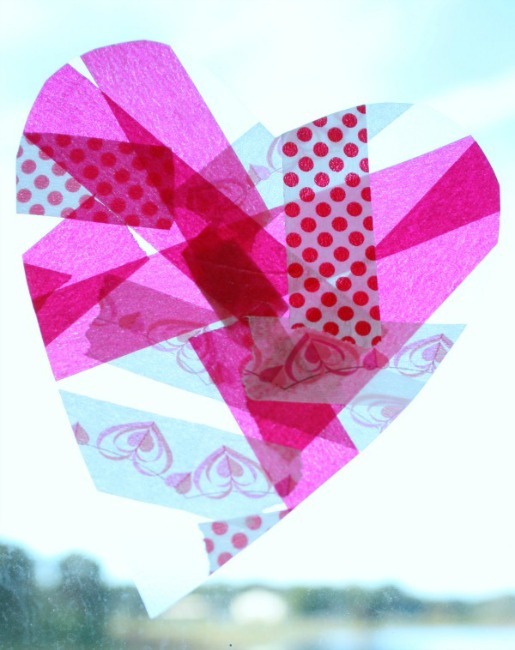 Tissue Paper Stained Glass Window from Happy Hooligans – What a fun way to decorate the windows this Valentine’s Day! 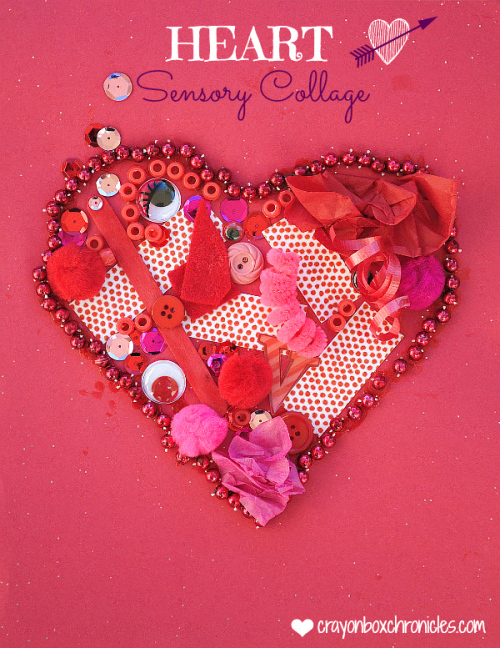 Heart Sensory Collage from Crayon Box Chronicles – Kids can explore different shapes, shades, and textures as they make this heart craft! Valentine Zip-Line from My Nearest and Dearest – Deliver valentines via zip-line! 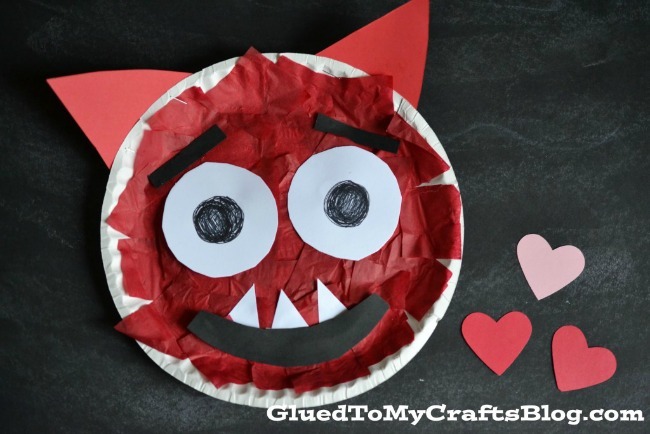 Paper Plate Love Monster from Glued to My Crafts – We love a good paper plate craft around here, so this book-inspired one will be a hit. 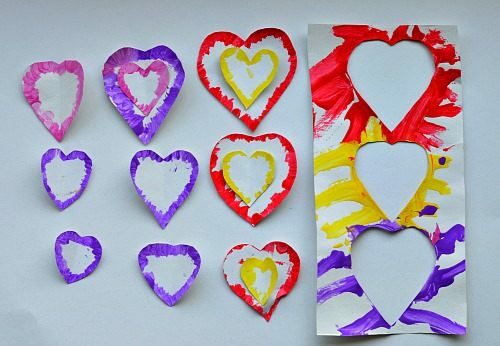 Valentine Heart Stencils from Kids Play Box – Make valentines and explore stencils for the holiday. 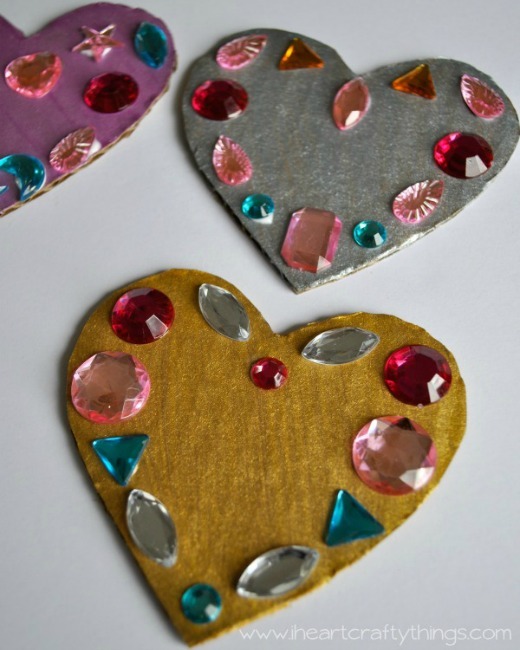 Jeweled Symmetry Heart Craft from I Heart Crafty Things – Add some bling to the Valentine’s Day crafts while learning more about symmetry. 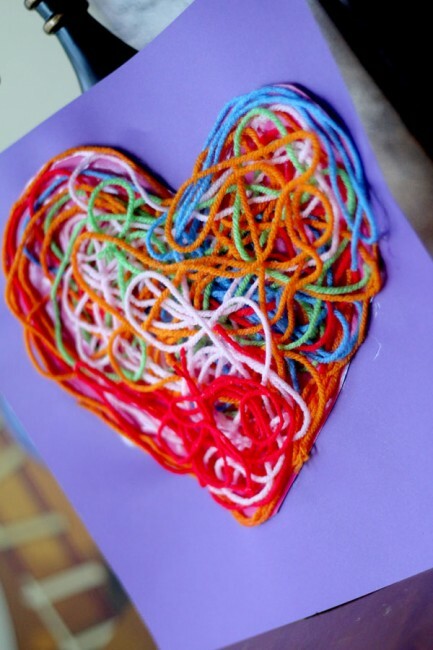 Textured Yarn Heart Craft from Hands-On: As We Grow – What beautiful colors and textures! 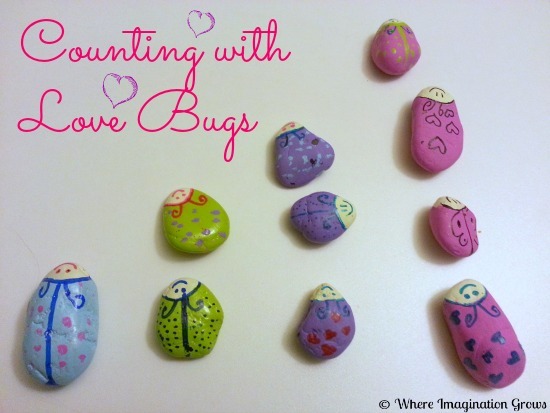 DIY Love Bug Rocks from Where Imagination Grows – Kids can turn found rocks into little love bugs that are perfect for gifts or games! 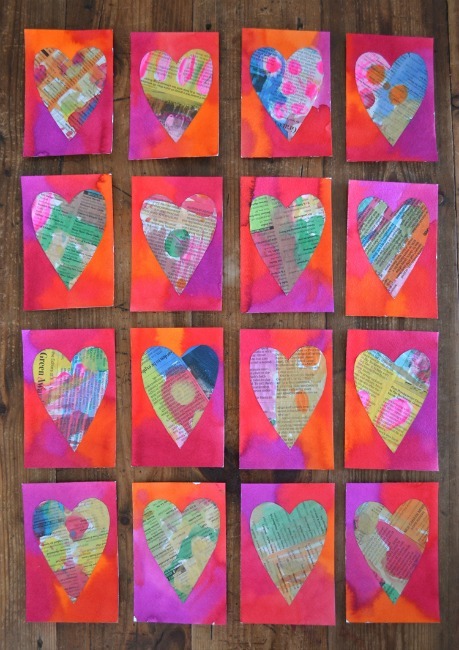 Newspaper Heart Postcards from Art Bar – What a gorgeous way to transform newspapers into valentines! 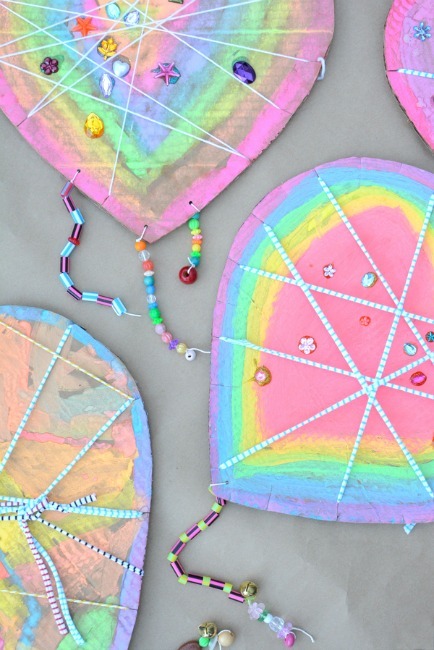 Easy Heart Suncatcher with No Contact Paper from Fantastic Fun and Learning – Just two materials and the kids are off and running with this suncatcher craft! 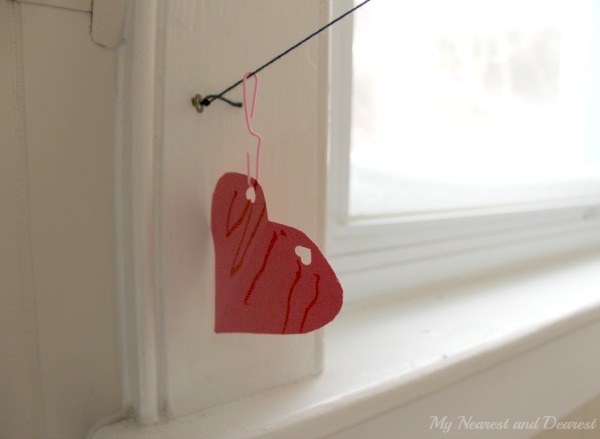 Love Catchers from Meri Cherry – What kid wouldn’t want to make a Valentine’s Day cream catcher? 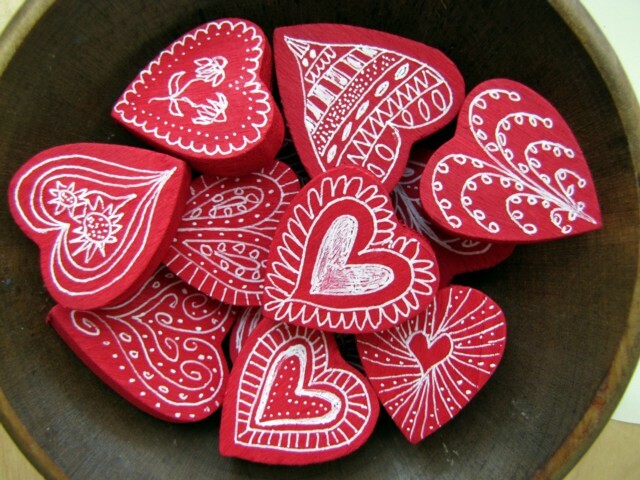 Hand-Decorated Wooden Heart from Kleas – The hearts in this picture are obviously decorated by an adult, but wouldn’t they look amazing with kids’ decorations too? 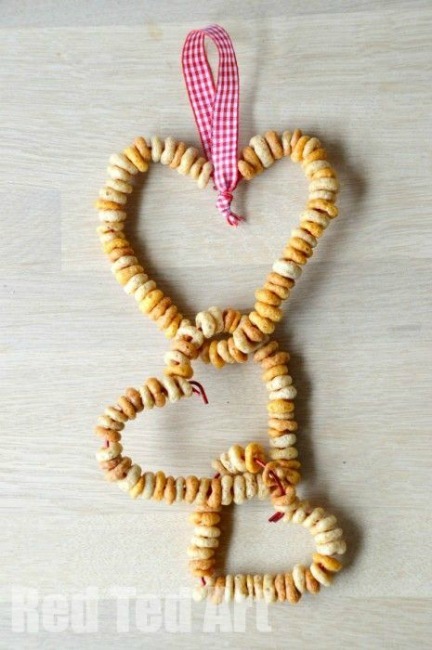 Easy Bird Feeders from Red Ted Art – Make a Valentine’s Day gift for the birds in your backyard, too! 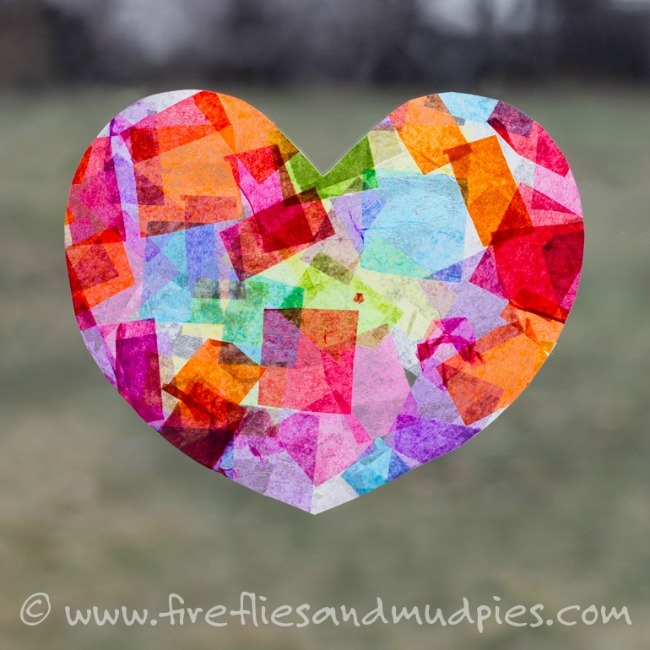 Rainbow Heart Suncatchers from Fireflies and Mud Pies – Love all of the colors in these sun catchers! 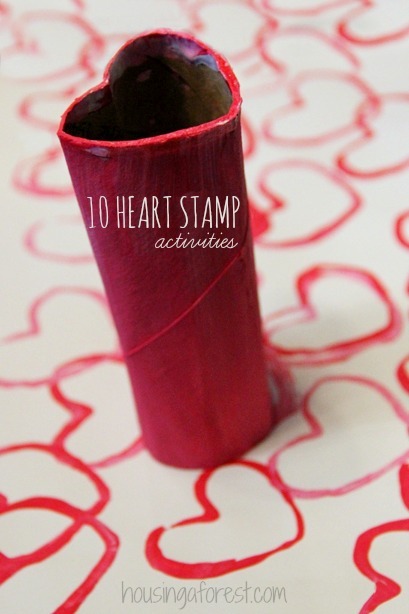 Heart Tube Stamping from Housing a Forest – 10 engaging ways to use heart-shaped cardboard tubes this Valentine’s Day! 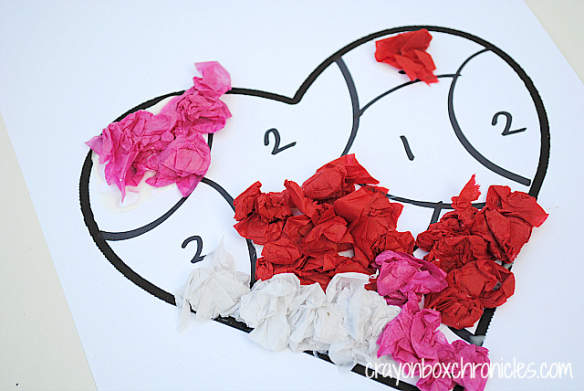 Heart Tissue Paper By Number Craft from Crayon Box Chronicles – Work on numbers, colors, and fine motor skills with this heart craft. 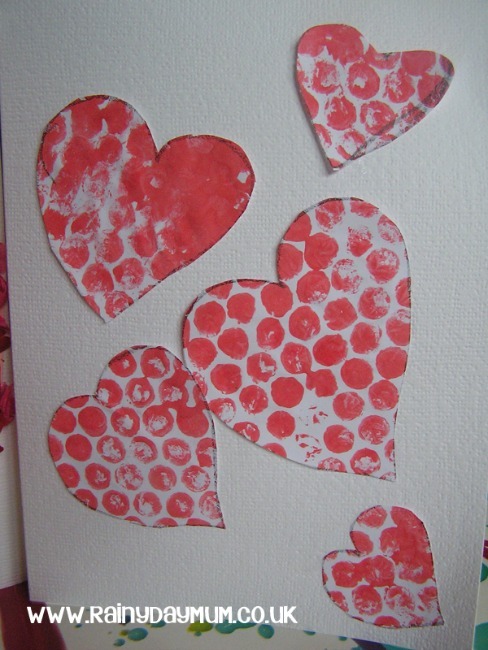 Bubble Wrap Printing Card from Rainy Day Mum – Bubble wrap makes everything more fun, doesn’t it? 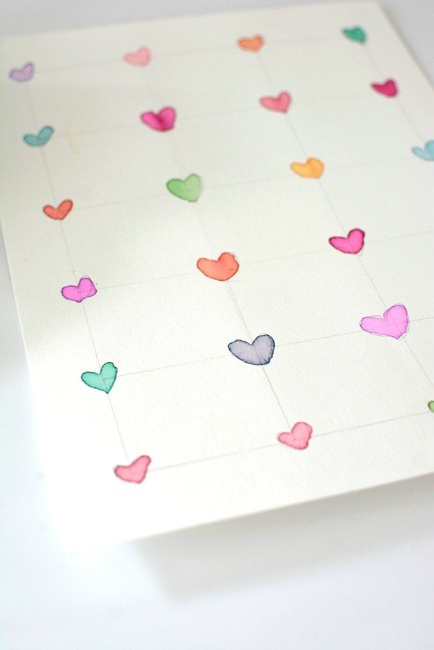 Heart to Heart Dot to Dot from Meri Cherry – What a cool mix of art and a game for Valentine’s Day! 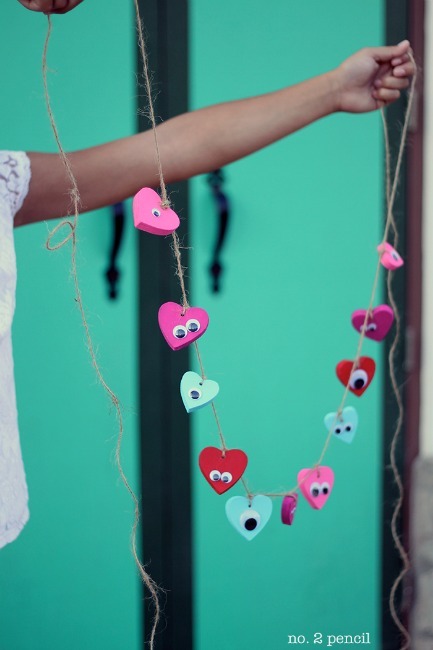 Googly Eyes Heart Garland from No. 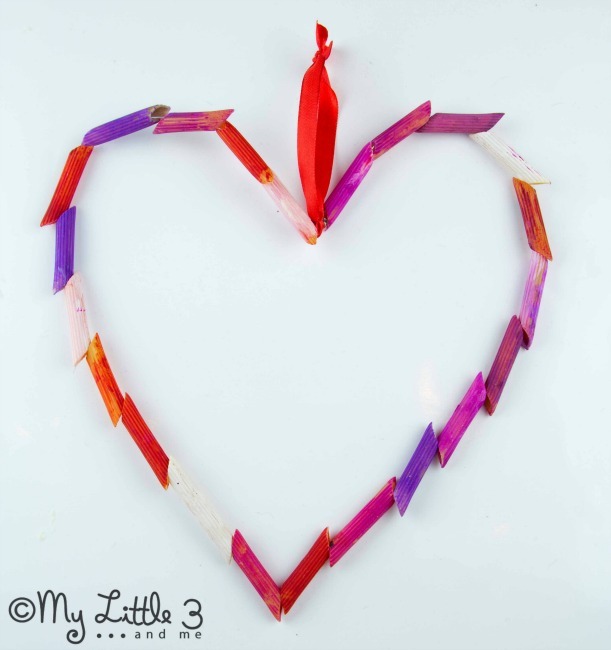 2 Pencil – Such a silly, fanciful garland to make with the kids. 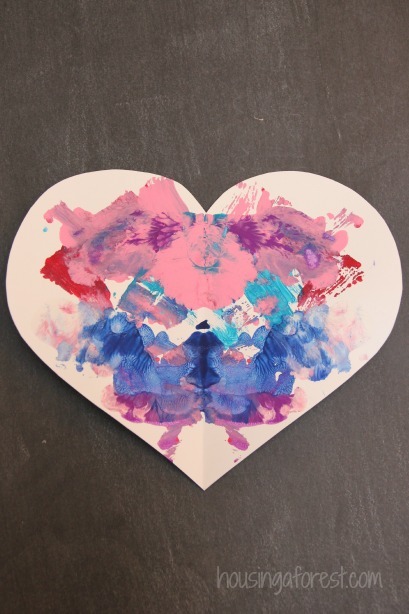 Symmetry Heart Painting from Housing a Forest – Have your kids ever tried symmetry smoosh paintings like these? There you have it! 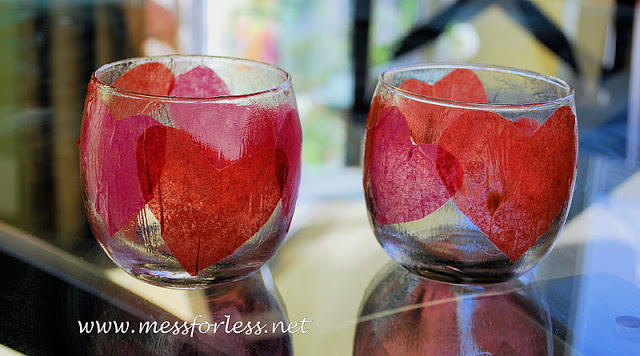 Oodles of Valentine’s Day craft ideas to keep us happily crafting until Valentine’s Day! Snow? No problem. Well, maybe not no problem – but tolerable. Well, hopefully tolerable. And this would be my first post complaining about winter in 2018! Happy winter friends, we’ll get through it together.